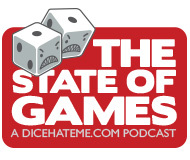 The State of Games, Episode 11 is fully stocked with bottled water, shotgun shells and plenty of spam and beans. There’s no apocalypse that we can’t handle as long as we can also bring along dice, cards, several hundred board games… wait, there’s not room for all of that? What’s a couple of well-prepared gamers to do? 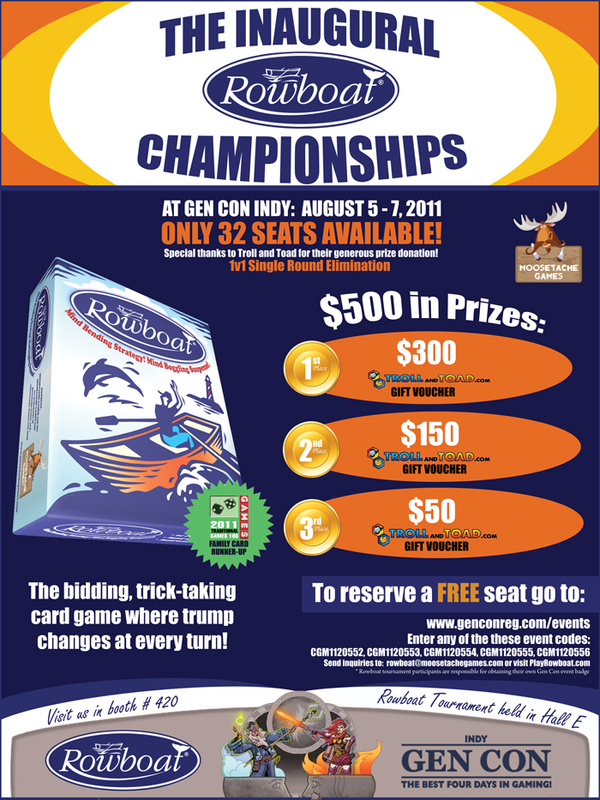 Don’t forget to enter the official Rowboat championships at GenCon Indy! Details in the flyer to the right (click to embiggen)! Attention all Dice Hate Me readers and The State of Games listeners! Our friends at Moosetache Games are giving away one copy of Hike and one copy of Rowboat to two lucky fans! Just visit the Moosetache Games Facebook page and post on their wall “I want to win the Dice Hate Me Giveaway!” It’s that easy! And don’t forget to share the love by Liking the page and spreading the good word to other gamers. Thanks for giving the shout out to Organized Chaos ( have my plays mentioned in Geek Lists on BGG ) and I contributed to White Elephant, so don’t let anyone y’all’s advertisement doesn’t ever work !! Oh and yes my comment –Onirim really freaked me out at first despite how purty it is , but I am getting into it . But only as a fancy solotaire– I am so not thinking any of my ” crew” would get into the fact this game I concur is STAGGERINGLY hard to win. (I haven’t yet. I also am not a big co-op guy.) But glad you gave it a shout out too and look fwd. to hearing more of y’all’s thoughts about it !! I would, of course, bring Carnival. How’s that for sucking up? More later when I actually listen to the episode. LOL..Tom stole my answer!!!!! Bad Tom!!!!! Actually the game that I am playing right now that I think would hold up is Troyes. P – We do love our surreal arguments! As for Onirim, we realized last night that we were missing a very vital rule that might make the game actually winnable now. haha. Enjoy White Elephant, and we’ll see about getting Organized Chaos to the table this weekend. Tom – Hahah! I told Monkey that we should have made Carnival our ultimate game. Shawn – Hah – nice answer with Monopoly. I guess that would probably keep any gamer busy during the Apocalypse. And Troyes would hold up well if Monkey actually liked it. Great podcast, as always! Thanks for the mention of White Elephant, I look forward to your review!